I bet you didn’t expect me, of all people, to begin my final reviews of Aldnoah.Zero with this subject line, right? And there are so many possibilities for what my choice might be—not Inaho, obviously, but there’s Slaine, or Asseylum, forced plot twists, characters that appear out of nowhere, bad medical science, too much technical jargon…what else have I missed? I started pointing out many of the mistakes as the second cour was airing, especially after I realised how badly the translator was misconstruing Slaine’s character because of his or her terrible work. But there were a number of them in the first cour too. For example, in the scene above, which is from episode 11, I believe Asseylum’s actually saying that “For the princess of the Vers Empire to have turned against her people…” In other words, instead of lamenting that her people have turned against her, this line represents her resolve to stop the fighting, even if it means turning against the Vers citizens that are attacking Earth. Why do I make this argument? The grammar of the line (「ヴァースの皇女たる私が、ヴァースの民を敵にするとは」) leaves room for either interpretation, and Asseylum’s self-criticism that “That this war began is my responsibility. I am to blame” can also be interpreted as her believing that her unworthiness as a ruler has ‘turned her people against her’. To me, however, the dialogue in a previous scene seems more supportive of my take. 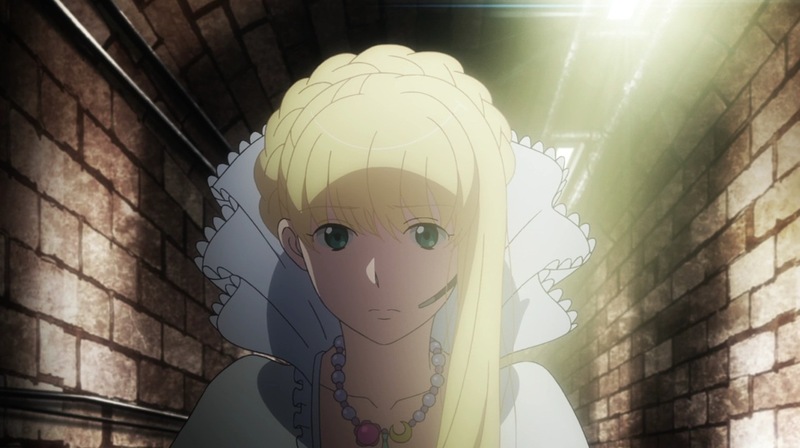 For example, straight after the base is attacked, Asseylum voices her realisation that her life didn’t matter at all, that “right from the start, the objective of the Orbital Knights was war.” This suggests a belief that they think of her merely as a means to an end, rather than as the object of real enmity that ‘turning against her’ suggests. She does not–and cannot, because Saazbuam and his faction were always careful to hide their contempt and hatred for her family–know that there are Vers citizens with a real grudge against her. In this case, then what Asseylum is blaming herself for is not that she ‘turned her own people against her’, but rather than she couldn’t stop the knights from starting the war and bringing pain and suffering to the people of Earth. .
I’m not sure if this would have made any difference for all the viewers who kept criticising her for ‘not understanding the problems of Vers’. The ‘official’ translation implies that, although she knew about it, she wasn’t doing anything to fix it. What I believe Asseylum actually said doesn’t actually indicate how much she understood of Vers’s problems, but it does show that she regrets and blames herself for believing that establishing formal diplomatic relations with Earth would easily solve the problems of her homeland, and for having to turn against her people in order to stop the rebellious Vers knights who plotted to kill her in order to begin the war. Unfortunately, she does not get the chance to reflect any further on it, or even to learn about why Saazbuam hated her family so much that he wanted to take revenge on them. In fact, it’s unclear whether she even knew, at that point, that what was driving his actions was hatred, combined with the desire to invade and conquer Earth in order to improve life for the people of Vers. It also says absolutely nothing about whether Asseylum herself wanted to improve the life of her people, though personally, I feel that that is the natural assumption from her original objective of seeking trading relations with Earth. Perhaps the seemingly widespread condemnation of this comes primarily from people who believe that ‘free trade’ brings more disadvantages than advantages? …for THAT was the line that struck Slaine to the core. I trust I don’t need to elaborate on how this one mistranslation screwed up how most of the Western Aldnoah.Zero audience interpreted Slaine’s arc and the rest of the show, right? NB: this post was heavily edited in October 2015, after I realised that I hadn’t explained why the difference in the Asseylum line above is so significant to how viewers interpret her character, especially amongst Western viewers. No matter how the translation is, the fact is Slaine betrayed the princess. Slaine didn’t go all the way because he has a gentle heart which is the quite opposite of Inaho (cold heart ice). 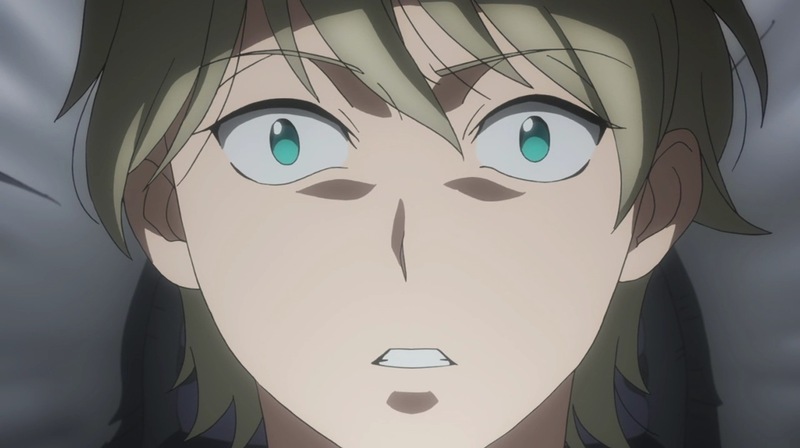 Slaine was doing what he thought would ensure that Asseylum would never face death again. And that’s one of the reasons he threw in the towel once Asseylum put herself in a position of power against him. A detailed explanation of how and why he thought that way requires more time than I have at present (the previous post I wrote about what A/Z is saying about war and conflict is a good place to start)…though if you’ve got your heart set on hating him, I doubt it’ll make any difference, so can you please drop it already? Also, Inaho is kinder than most people notice. He just shows his kindness in very strange ways: e.g. in the final episode, when he didn’t confirm to Slaine that he lost his eye in their encounter 2 years before, instead painting it as if he’d just decided to have a robotic eye implanted because he needed it for the war. And no, sorry, I’ve never been to South America. Well… what the heck? That explains a lot! I thought Saazbaum sees himself as a martyr and hypocrite, since his words were rather contradictory. Now I understand. And now Slaine shooting Inaho in S1 finale seems less random. And that Asseylum’s line, would have clarified a lot of people misconceptions. Doesn’t it? If I was annoyed with the translator after noticing some of the other screw-ups, I was incensed when I realised this one last week. And I was cheesed off at myself for not looking into it when the first cour ended last year! Personally, I’d thought that Saaz had done that to trick Slaine into helping him — after all, he opened the communication channel just when Inaho had really gotten the upper hand on him. But to me, it makes more sense if this is what Saaz meant, and he really believed it. About Asseylum’s line though: I’m really not sure it would have clarified that many misconceptions. A lot of people still hate her for something that I think requires an understanding of Japanese behaviour in the first half of the 20th century as well as how that behaviour is regarded in Japan today…and I believe most Western viewers don’t really get anything about it. I find it nice how they explained a little about the ending in that magazine page (was it Animedia?). Its got whims of philosophy and realism. Though a lot of viewers will still miss that, I guess they still expecting/wanting satisfaction through blood of thine enemy, and holier-than-thou verbal smackdown. To be fair, I too was looking forward to it but because its the norm of anime. I enjoyed the new non-traditional ending. In a trend where everyone is pushing for more extreme, more gore, and attitude, which the western audience liked, (AoT, Death Note, Kill-la-Kill) A/Z might seem counter-intuitive despite having more quality and realistic message? ?? You mean the snippet posted on the AS forum? I think I can see what you might mean by ‘whims of philosophy’, but I’m not sure what you meant by ‘whims of realism’. I think most A/Z viewers took a very black and white view of things: they either wanted Slaine to be completely black and thus to deserve death, or to have a goal that would be proven righteous by the improvement that he would bring about in Vers society. Well…that’s a simplistic way of putting it, but the general reaction to the ending seems to suggest these two extremes… To be honest, I really didn’t think anyone could have written a show with what Slaine stood for (= invading another state for resources) to be judged as ‘the right path’, not with what Japan did in the first half of the 20th century… And since Slaine did not completely throw away his humanity, I was afraid that they were going to make him go out ‘in a blaze of “glory””…without anything positive ever happening to him. So…yeah, I’m glad they chose this ending instead. Though ‘non-traditional’ ending?? But…what is a traditional ending? Do you mean a traditional Western ending? I’ve been watching Japanese media for years, and to be honest, I’ve seen quite a few endings which have left me with a similar feeling: ‘it’s not a romantic ‘happily ever after’ ending, but it’s a suitable ending’. Sadly I have to agree with the rest of fandom. Even most Japanese fans didn’t care for it, from what I’ve seen and mentioned on 4chan and other places. There were complaints on 2ch, IIRC. On a different note, I think you were asking for May’s Animedia scans that mention A/Z, right? Someone posted the pages on Asuki! I’d like to hear your thoughts on the staff/cast interview. Aoki said that Slaine willingly took the blame. Do you think it was his suggestion all along to bring in the peace? I’d rather hear it from an unbiased point of view like yourself than say, the 4chan anons who I suspect skew things since they’re generally the anti-Asseylum crowd. I don’t like Asseylum at all myself (which saddens me since I used to like her at first), but they’re just too much. Sheesh. I’m going to try and post a proper review over the next few days – would you mind if we put off the discussion until then? I do talk about some of the issues you had (if I recall – I’ve been trying to work on that post for a few weeks now), so it would be really helpful for me if we could. On a different note, I think you were asking for May’s Animedia scans that mention A/Z, right? Someone posted the pages on Asuki! I’d like to hear your thoughts on the staff/cast interview. Aoki said that Slaine willingly took the blame. Do you think it was his suggestion all along to bring in the peace? Yeah, much gratitude to Cloudedmind as always! A few anons from 4chan translated/put up the basic summaries of the A/Z Animedia article. Reading the translations again, though, I’m a little confused. https://archive.moe/a/thread/123916633/#q123925872, specifically the part that says “Also Slaine’s action are deceiving the society, and he is considered an evil person by the world, but I wanted to show his immature parts that are being wronged due to his kindness and pureness.” I’m guessing other anons took that to mean that Slaine made the choice to take the fault but is being taken advantage of. The “deceiving the society” part is what’s throwing me off. That was from the Newtype interview…and let’s just say that I hung my head in my hands a few times reading that attempted translation. Admittedly, I was even more amused at what the posters there think war and politics is all about. 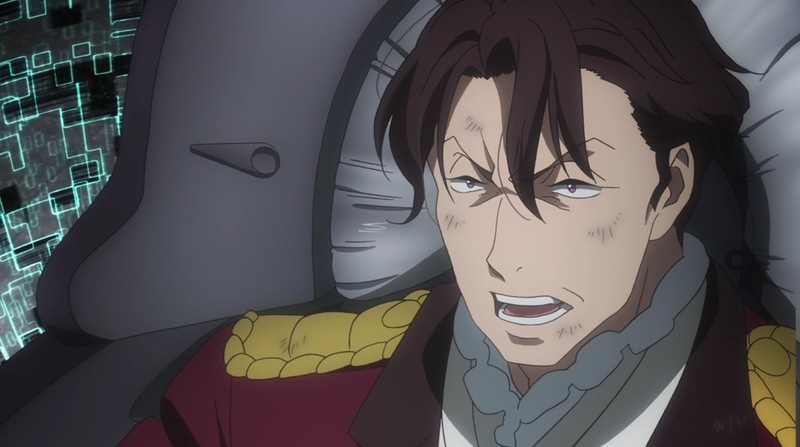 The fact that very few people in the English-speaking fandom realised that Inaho was referencing Carl von Clausewitz’s most famous statement about war (and that even fewer bothered to look up what Clausewitz actually wrote) says it all. According to social norms, Slaine’s actions are wrong, and he’s regarded as a villain by the world. However, it’s because of his inexperience that his pure and kind nature sent him down this misguided path. On twitter and in interviews, Aoki has been very firm that what Slaine did was mistaken/wrong — Slaine even lays it out for us in the final episode, with his “I deceived, I stole, I killed. I sacrificed many of my own.” But Slaine did all that because he believed it was the only way that a peaceful world could be created. In other words, his kind and pure nature is what made him believe in the possibility of a peaceful world of coexistance (which inspired Asseylum’s dream), and his inexperience is what leads him to the mistaken belief that ‘such a peace is only possible if one side is completely defeated’. And for Slaine, the only path that he himself could take towards that outcome was to rise up in Vers and unite the limited–in comparison to the thousands, perhaps even millions of people that the UFE can call on–but powerful Vers military strength towards becoming the victorious side. In his Animedia interview, OnoKen talks about how Slaine has been really unfortunate in terms of timing, as well as in terms of not having the incredible support network that Inaho had around him. But I think that this is just all part of what Aoki said here. I figured that was the reasoning! I was confused by that anon’s wording so I was like “… bwuh?” I could see why some people thought that Slaine willingly took the blame from there. Poor Slaine. I’m always such a sucker for characters like him who do questionable things for the sake of a loved one, even if they have to suffer for it. His lack of proper experience in war and having crappy luck aren’t doing him any favors.